Delving into the Settled Science of Loch Ness is a strangely surreal and murky experience. The history of scientific investigation really starts at the beginning of the 20th century. The status of Loch Ness as Britain’s greatest body of fresh-water was established by Murray and Pullar (1903-08 and 1910) during their Bathymetrical Survey of the Scottish Fresh-water Lochs. A Pullar wire sounding machine was used in April 1903, and 1,700 soundings were taken from a rowing boat in a series of across-loch transects. This revealed a steep-sided, flat-bottomed trench-like profile resulting from the Great Glen’s tectonic origins. Thus, despite being second to Loch Morar (310 m) in maximum depth, Loch Ness (maximum depth 230 m) has the greatest mean depth (132 m) and hence the greatest volume (74.52 m3 x 108 ) of all British lakes. Loch Ness is a large, deep, freshwater loch in the Scottish Highlands extending for approximately 37 kilometres (23 miles) southwest of Inverness. Its surface is 16 metres (52 feet) above sea level. About two hundred years ago Loch Ness boasted two small islands but the construction of the Caledonian Canal raised the water level by six feet and the smaller of these islands disappeared beneath the waves. Eilean nan Con, or Dog Island, can seldom now be seen above the level of the water ; hence an iron post has been affixed to one of the rocks of which it is composed, in order to warn off the boats that pass with their freight of salmon fishers. Prior, however, to the making of the Caledonian Canal at the beginning of last century, Loch Ness was 6 feet lower than at present. Under these circumstances Eilean nan Con would have been about 20 yards long by 15 wide. The formation, however, of the rock, as it is seen in very dry weather, points to this being merely one of the many rocks which raise their heads along the sides of Loch Ness. No artificial material can be detected about it, whilst the water between it and the shore is so shallow that Eilean nan Con could have afforded no protection in the days when craiinogs were so safe a refuge for the dwellers upon them. It may be of interest to note that in other cases where an island-castle or fortress has existed, a small isle in the immediate neighbourhood is still known as Eilean nan Con, from the fact that when the castle was a hunting-seat, the Dog Island was the home of these faithful beasts. I believe this to be the case with the islands on Loch Laggan in Badenoch. The Rev. Odo Blundell, O.S.B., F.S.A. Scor. The canal finally opened in 1822, having taken an extra 12 years to complete, and cost £910,000. The remaining Cherry Island “is of much greater interest”. Eilean Muireach, properly Murdoch’s Island, but popularly Cherry Island, is of much greater interest. It is situated about 150 yards from the shore : its highest portion is about 4 feet above the average level of Loch Ness ; whilst, though at present only about 60 feet by 48 feet, there are several fair-sized trees growing on it. In former times there would have been many more, but one result of the raising of the water of Loch Ness was to submerge the stems of the trees nearest the island shore, so that they soon decayed and broke off, leaving the stumps to deceive the casual observer with the idea that these are some of the old piles on which the island was built. In 1907 the suggestion was made that Eilean Muireach would probably prove to be a crannog, and with this object in view the following investigations were carried out in August 1908, at a time when Loch Ness was unusually low and the water fairly warm. The first discovery of interest was the fact, ascertained by means of a long pole, that at a regular distance from the margin of the island the rubble ceased, and the pole struck the soft bed of the loch. Moreover, it was found that the bed of the loch was struck at a depth of 12 feet, and at a distance of about 112 feet from the island shore. This led to the conclusion that the banks were at a regular pitch of about 1 in 10. In order, therefore, to determine the original size of the island prior to Loch Ness being raised 6 feet, about 60 feet must be added to the radius or 120 feet to the diameter of the present island. Taking this now as 60 feet by 48 feet, we find that formerly the island must have measured 180 feet by 168 feet. This is where the Settled Science starts to get murky because the mainstream classifies Cherry Island as an Iron Age “artificial island, known as a crannog”. 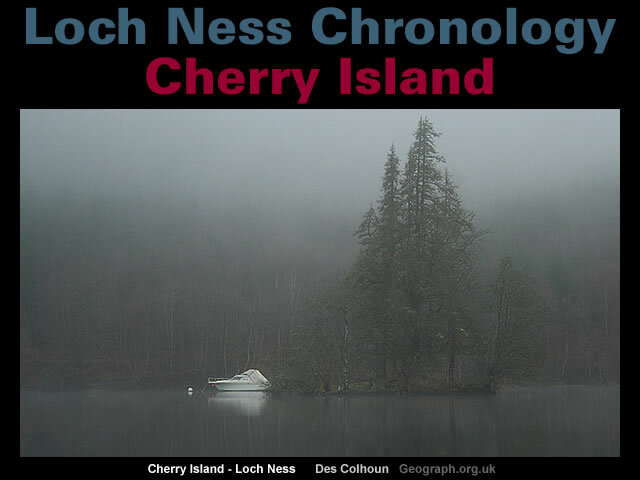 Loch Ness has one island, Cherry Island, at the southwestern end of the loch, near Fort Augustus. It is an artificial island, known as a crannog, and was probably constructed during the Iron Age. Firstly, an Iron Age attribution is a fairly grey and amorphous designation with plenty of wiggle room when it comes to dates. Meteoric iron has been used by humans since at least 3200 BC. Secondly, the “artificial island” [aka crannog] attribution is another grey and amorphous designation with plenty of wiggle room. A crannog is typically a partially or entirely artificial island, usually built in lakes, rivers and estuarine waters of Scotland and Ireland. Crannogs were used as dwellings over five millennia, from the European Neolithic Period to as late as the 17th/early 18th century, although in Scotland there is currently no convincing evidence in the archaeological record of Early and Middle Bronze Age or Norse Period use. The actual number in Scotland varies considerably depending on definition – between about 350 to 500, due to the use of the term “island dun” for well over one hundred Hebridean examples – a distinction that has created a divide between mainland Scottish crannog and Hebridean islet settlement studies. Island settlement in Scotland and Ireland is manifest through the entire range of possibilities ranging from entirely natural, small islets to completely artificial islets, therefore definitions will invariably remain contentious. The mainstream probably needs some wiggle room with Cherry Island. The observation that “the bed of the loch was struck at a depth of 12 feet, and at a distance of about 112 feet from the island shore” implies Cherry Island is a 16 feet high circular mound with an average diameter of [about 278] feet. Therefore, it’s arguable Cherry Island is a natural island [like Dog Island] that was adapted for human habitation when the Loch Ness water level was 12 feet lower. Either way, a “castle” was subsequently built of stone and oak on Cherry Island. The remains were observed by the very intrepid Reverend Odo Blundell in 1908. It had occurred to me that advantage should be taken of the canal diving-suit, which could he hired at a small cost, and accordingly on 7th August a start was made soon after 2 o’clock. By the time the island was reached and the diving-dress adjusted it was about 3. The first descent was made in about 12 feet of water on the west side of the island, but, owing to the inexperience of the amateurs at the air-pump, little serious work was done. The excess of air which was supplied to me had the effect of making me so buoyant that I was floating over the tops of the stones instead of stepping firmly on them, and that despite the two lead weights of 56 lbs. each attached to the already very heavy helmet and boots. Yet, even with this disadvantage, some points of interest were ascertained. First, the pitch of the rubble was perfectly even, evidently laid down on some regular plan, for under the first layer of large stones, all about 1½ feet long, there was the great mass of rubble, composed of much smaller stones 6 to 8 inches long. The larger stones were evidently intended by the original builders to be a protection to the smaller. Secondly, it was interesting to observe the clearly defined line between the rubble building and the mud of the loch bottom. This was absolutely clear of stones, except in one case where a large mass, apparently of vitrified matter, lay about 20 yards from the rest of the stones. The third point of interest, which I noticed only a few minutes before it was time to ascend to the surface, was a spar about a foot in diameter, the one end of which was embedded in the floor of the loch, whilst the other end ran right into the rubble building, leaving about 4 feet exposed to view. Expecting to find this easily on my next descent, I returned to the ladder and mounted to the open air. After resting a quarter of an hour (during which the two experienced divers, who had charge of the life-line and air-tube, heartily congratulated their new apprentice on his successful performance from their point of view) I went down again, with the intention of following up the clue afforded by the embedded spar. The half-inch of sediment, however, which covered everything, had been disturbed by my previous visit, so that the water, instead of being perfectly clear, had a muddy appearance, only allowing one to see about a foot in front of one. For twenty minutes I walked to and fro, feeling for the spar, but had to return to the open without finding it. The third descent was made on the north side of the island, and proved most interesting. Traces of the old causeway could be distinctly seen, starting at a point at the north-west corner of the island and going straight in the direction of three large boulders on the mainland, which were known from tradition to be part of the approach from the land side ; but as a castle certainly existed on the island in the fifteenth century, it is uncertain whether this causeway formed part of the original building or not. Of still greater interest was it to find the floor of the loch at this point covered with beams of wood about 8 inches by 4, and 10 feet to 12 feet long. Every effort to dislodge one of these was unsuccessful, so tightly were they fastened together. A broken piece about 5 feet long was at last secured, and carried with one hand to the ladder, in mounting which it proved to be no obstacle. But when one end was handed to the two strong lock-keepers, they found it so heavy that they were scarcely able to lift it into the boat. This beam, which is of oak, is perfectly sound, and is preserved in the Abbey museum. It appears to have been roughly squared, and the beams on the floor of the loch had the same appearance. This floor of beams can be traced all round the north side of the island, whilst at intervals large trunks measuring 3 feet in diameter and 10 to 12 feet long were found lying along the line of rubble building. From these trunks, spars similar to the one seen at the first descent were observed running into the rubble building. The same even pitch of the building was very marked, as also the sharply defined line between the artificially placed stones and the muddy floor of the loch. During the days following this first investigation, I thought over what I had seen, and decided, before speaking much or writing about the peculiar floor of oak beams, to make a second investigation, and if possible to confirm the results of the first. Accordingly, on 31st August, a start was made in the early afternoon, and on reaching the island a descent was made on the north-east side. It was not without considerable satisfaction that I found the flooring of planks in this direction also, as well as two very large trunks of trees, lying, like the ones described above, along the line of rubble building, which they were evidently intended to keep in place. From these large trunks the same arrangement of spars extended into the stonework, which on this side was more irregular, due, no doubt, to the high east winds and large waves which beat on the island in this direction. Indeed, at the south-east corner of the island a long narrow ridge of stones was very noticeable, evidently intended as a breakwater to protect the stonework. By the kindness of Rev. Cyril von Dieckhoff I am enabled to submit a sketch which gives a very good idea of the construction, though the pitch of the rubble has been exaggerated to 1 in 5. The floor of the loch, which on the west side of the island was covered with verdure, was almost devoid of vegetation on the east side, the clay mud being nearly bare. Mud, however, it was, and not rock, for I repeatedly embedded my hand in it, though the clammy nature made considerable effort necessary to effect this. Indeed, on one occasion the small anchor which held the coble stuck so fast in this clay that it needed three men with all their force to raise it. On reaching the surface the anchor was found to have about thirty pounds weight of clay sticking to it. On none of the four sides was the natural rock to be seen, always the verdure-covered floor of the loch, except in those cases where the clay was bare, that is, on the storm-swept side of the island. Taking, therefore, the points above mentioned into consideration – the wooden flooring, the trunks of timber lying along the circumference of the building, and not to be seen elsewhere, the gentle and symmetrical pitch of the rubble, the even surface presented by the layer of large stones with the smaller ones underneath, and the clearly defined margin between the rubble and the floor of the loch quite free of stones – there seems to be ample proof that the whole island was originally of artificial construction. The discovery of a large mass of “vitrified matter” suggests the “castle” [like it’s more substantial Loch Ness companion: Urquhart Castle] can be classified as a Vitrified Fort. Vitrified forts are stone enclosures whose walls have been subjected to glass transition through heat. It was long thought that these structures were unique to Scotland, but they have since been identified in several other parts of western and northern Europe. It is not clear why or how the walls were subjected to vitrification. Most archaeologists now consider that vitrified forts are the product of deliberate destruction either following the capture of the site by an enemy force or by the occupants at the end of its active life as an act of ritual closure. It’s likely parts of Cherry Island castle were vitrified towards the end of the 1st millennium but the mainstream is unable to confirm [or deny] this possibility because they appear to have lost interest in the island after the adventures of the Reverend Odo Blundell in 1908. So we will have to wait awhile longer to discover whether archaeology decides the “vitrified matter” at Cherry Island was created by an underwater “act of ritual closure”. Gallery | This entry was posted in History, Vitrified Hill Forts. Bookmark the permalink.